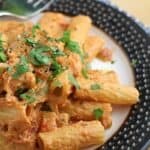 Pasta in a heart healthy vodka tomato sauce. 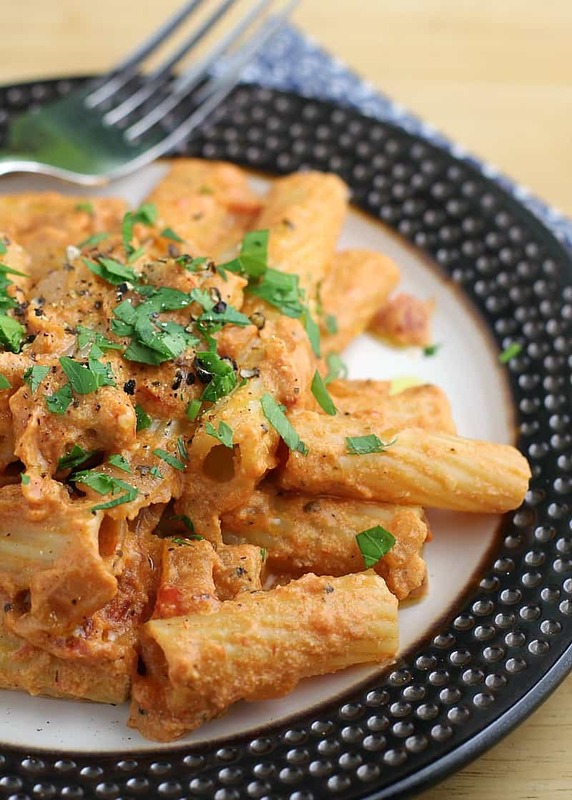 Just as good as the classic, this easy Vegan Pasta alla Vodka dinner recipe uses a cashew cream in place of dairy to nourish body and soul. All the comfort of a creamy, glorious pasta dish, with better ingredients. It will make your heart smile. Whoah, wait a minute. I’m talking about “heart healthy” this and that but I use a cup of booze? …Yes, because SCIENCE! Alcohol has a lower boiling point than water (159F vs 212F). Vodka is 60% water. So, when we bring it to a boil and reduce the liquid by two-thirds as in my recipe, that amount of reduction ensures a significant decrease in the level of alcohol that remains. Translation: In this finished dish, the amount of residual alcohol per serving is insignificant. Science is so awesome. Besides, this flavor ❤ …. Crisp, clean, delicious. Is there anything cashews can’t do?? The Boursin-Copycat Cashew Cheese I gave you a a couple months ago – I have made that recipe every week since. I keep a little tub of it in my fridge at work for afternoon “cheese and crackers”. Cashews are the classic thickener in Indian Butter Chicken. They can be used to make a fabulous sub for sour cream. And I used them to make Cheddar Beer Sauce over poutine. Cashews are the solution to so many dishes when you are trying to cut back, or outright eliminate, dairy. It is a miracle nut. Why eliminate dairy tho? I cut it for animal welfare and climate change concerns, although since my Ironman I have let cheese back into my life. Because pizza. I do try to limit it though. But I have been surprised how many friends are cutting dairy for other reasons. One friend told me she’s cutting it because menopause is wreaking havoc, and dairy promotes inflammation. Also because it is harder to regulate body weight as she’s getting older (you feel me there, I know you do). 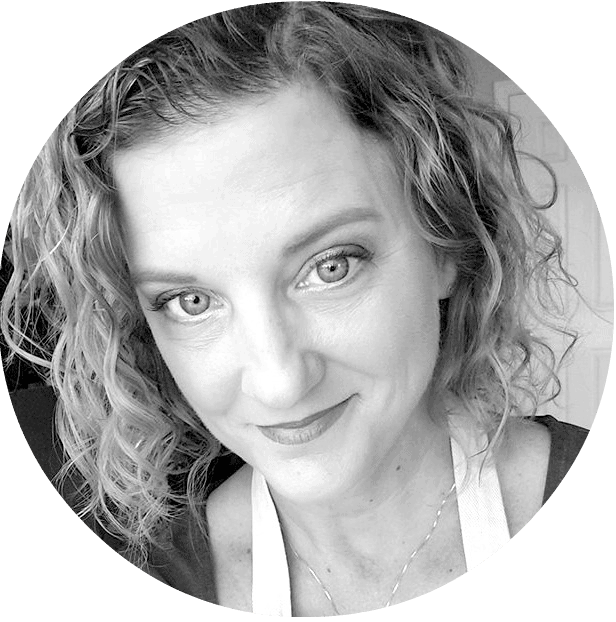 Another friend was told by her doctor to cut dairy (and soy and gluten) in an elimination diet to figure out what is messing with her system. And my nephew is completely intolerant. So there are lots of reasons to at least cut back dairy. And I love how this recipe proves you can cut dairy and not miss it. Not one little bit. On the other hand, cashews are rich in minerals like copper, manganese, and magnesium. They are rich in antioxidants, vitamins, and flavanols. They have a lower fat content than other nuts, but the fat they have is the healthy kind, oleic acid. Naturally anti-inflammatory. So, if you, sayyyy, have a close family member that you love and adore with all your heart …who recently had a less than stellar (cough cough) cholesterol report at his – errr, their – annual check-up, then you should consider sneaking cashews into them. I sneak healthy food into my family all the time, don’t you? It’s a mom thing. Toss in a little shredded carrot here, almond milk there. And spinach in damn near everything. We have to. And, oh by the way, this recipe is easy to prepare too, making it weeknight perfect. Such a good Mom meal. Annnd, the leftovers taste awesommmme for lunch the next day. And without an oil slick left in my container either, because we do not use cream so this sauce does not break. Love love love this recipe. So that’s it folks! 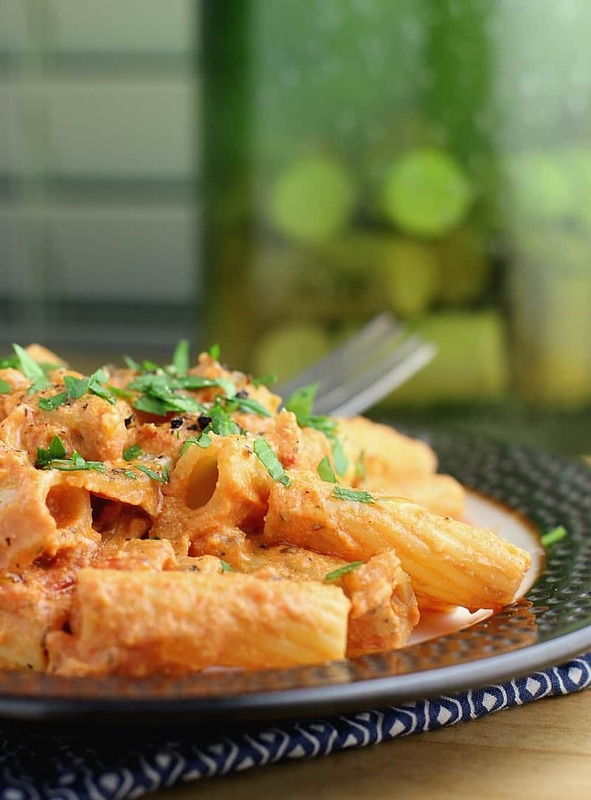 Easy and healthy comfort, in the form of a dreamy plate of pasta. To help us get through the busy times and make up for the less-than-healthy times. Enjoy. All the comfort of a creamy, glorious pasta dish, with better ingredients. Heat the olive oil in a large skillet over med-high heat. Add the onion and cook until slightly softened. Add the garlic and cook, tossing regularly until onion is translucent. Slowly add the vodka (especially be careful if cooking over an open flame). Simmer until liquid is reduced by ~2/3s. Reduce heat to medium-low. Also, during this time add the pasta and a handful of kosher salt to the pot of boiling water and cook pasta according to package directions. Meanwhile, process the cashews plus 1/2 cup water in a food processor until very creamy smooth. Scrape down the sides of the bowl if necessary. Add the cashew cream and the marinara to the onion mixture. Stir well and heat gently to warm through. Season well with salt and pepper to taste (will need a good amount of kosher salt, at least ~1/2 tsp). Once pasta is done, drain and add to the sauce. Serve topped with parsley, additional fresh cracked pepper, and a little drizzle of olive oil. This is my kind of pasta dish! I order similar things at restaurants all the time. Maybe ill try it! This looks so yummy. I never would have thought to put cashews in it. Thanks for sharing the recipe. You had me at vegan! I’m a huge fan of pasta. I’ve had a vegan mac and cheese made with cashews too! It was SO great. I told my friend – who had made it – that if she cooked like this for me every day, I could totally be vegan! 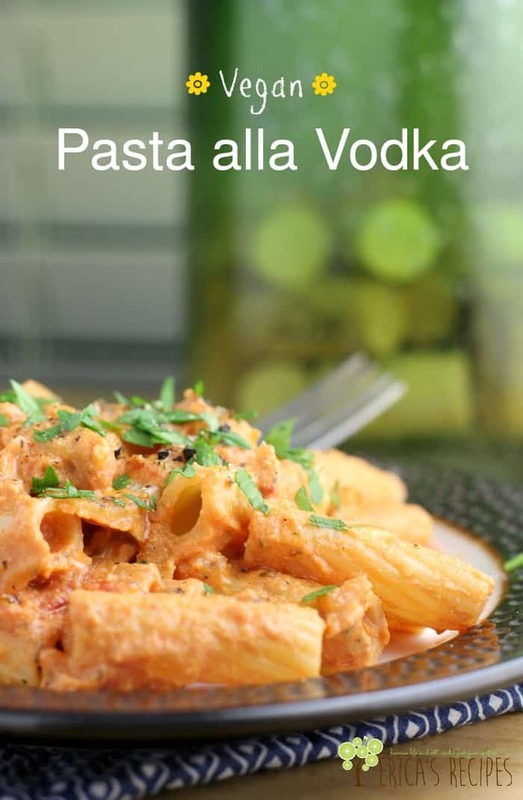 I love pasta alla vodka. Hubby would enjoy this, he loves cashews and other nuts. Love the idea of using cashews. Those are ver common on Indian cuisine and make such a nice texture. This is actually turned out to be an informative post. I was unaware of this science that vodka can be healthy in cooking, and I never considered its properties as well. Now this is what I call “Food Science”. 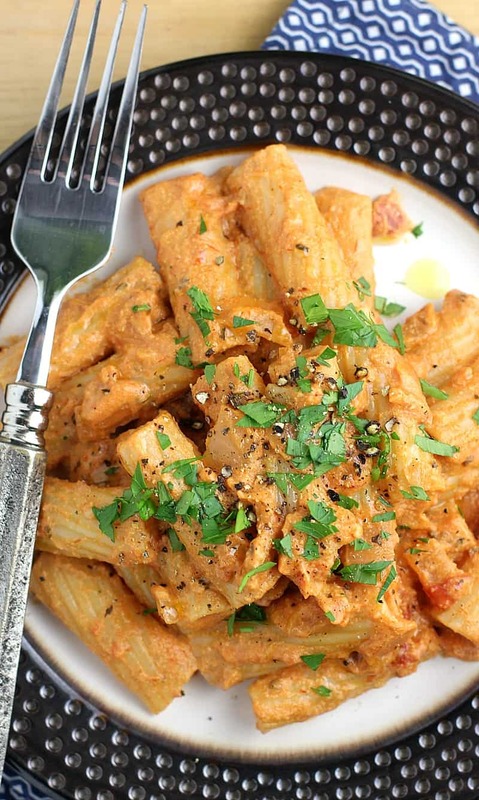 Thanks for sharing this recipe and explaining why it is heart healthy. I’ve never had vegan pasta but I hear that a lot of the vegan options are delicious. This dish looks delicious and I am really curious to try it for myself.